We’ve got a fun way to get in the coastal spirit and share the love! They’re DIY notecards made out of scrapbook paper card stock. It’s so simple, and the endless possibilities of colors, textures, and shapes are so much fun to play with! Great for young to old (just watch the young’uns with the scissors), these are a creative and easy craft. This would make for a fun activity to do with the family, with friends, or for a craft party. Just set out the supplies, maybe some snacks, and you’ve got yourself an afternoon of crafting heaven! We love that they’re so versatile as thank you cards, “thinking of you” cards, Valentine’s day love notes, and why not make a set to give as a special gift? Personalize to your heart’s desire with initials, favorite colors, and textures! 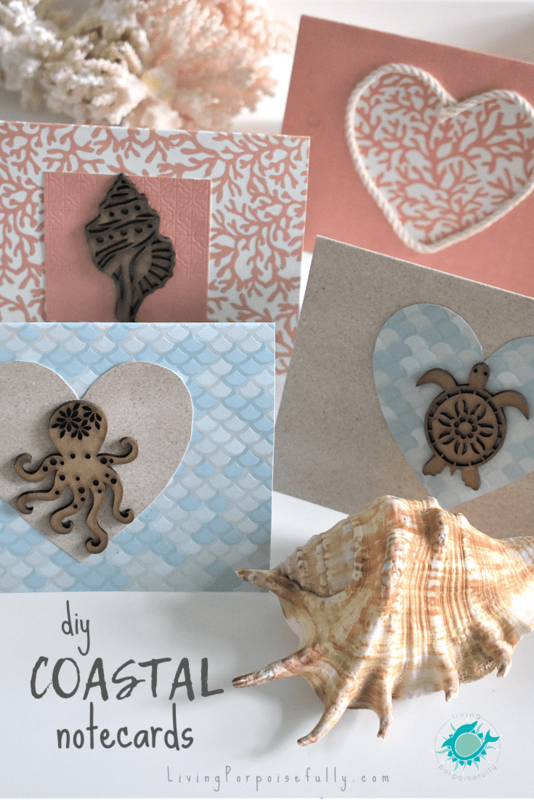 We chose laser cut ocean animals as the stars, and accented with nautical rope — you could add flat seashells or other accents you might find at home, the beach, or in the craft store. Re-purpose what you might already have and get creative! 1. Measure your envelopes to figure out what size to make your cards. Ours were 5.5″ x 4″ when folded in half, so we made our outlines 5.5″ x 8″ (and had to trim a little to fit in the envelope). 2. Choose the color combos that you want, and measure out the size with a ruler on the back of the scrapbook paper or card stock (card stock is best). You can trace the heart stencil, make a square or rectangles! 3. Cut out and fold the cards. Trim any excess on each side, and be sure to TEST the card by putting it into the envelope! If it doesn’t fit in easily, trim a bit on the sides. This is where the afternoon can seem to disappear as you try this combination and that. Get your creative juices flowing and have fun! Next Post Exclusive Look: Children’s Book Makeover!